After learning some of the useful ways to say 'thank you' in French, you'll need to know some of the different ways to say 'you're welcome' in French. These are undoubtedly two of the most important French phrases for travelers. First of all, recognize that saying 'you're welcome', just like in English, could either be used to respond to someone else's 'thank you', or it could be used to tell someone that they are welcome when they arrive. This is one of those times when learning from a dictionary can be difficult! There are many ways to say 'you're welcome' in French, ranging from the very informal de rien to the formal and heartfelt je vous en prie. To find the perfect phrase according to French cultural norms, read the description to see which phrase belongs in which situations. Pronounced duh ree ehn, this simple phrase is the staple of 'thank you' phrases, literally meaning: 'it's nothing'. If someone thanks you for holding a door open or for picking up something that they dropped, de rien is the phrase that fits the bill. In informal situations, this phrase is very common. This phrase has two forms: the short form pas de quoi (pronounced pah duh kwah) stems from the original phrase il n'y a pas de quoi (eel nee ah pah duh kwah), meaning 'don't mention it.' This is another very informal phrase, most likely to be heard among friends and family. De rien is more common when responding to strangers. This phrase (pronounced ah vek play zeer) is a stronger response to 'thank you' and means something similar to 'it's my pleasure'. You'll hear this in similar situations to when one would use 'it was my pleasure' in English, such as when responding to a 'thank you' for a gift. Pronounced jeuh vooz ohn pree, or jeuh tohn pree, this is the most heartfelt way of saying 'you're welcome' without expressing something like 'it was my pleasure'. Je vous en prie (for strangers) or jeuh t'en prie (for friends, etc.) is a way of telling someone that they really are welcome. While de rien can be a somewhat automatized response to merci (mair-see), je vous en prie signals that the speaker really understands that the other person is truly thankful and that he or she is truly welcome. Note: The 'j' in 'je' sounds similar to the 's' in 'measure' as opposed to the hard pronunciation of the Anglophone 'j'. This phrase also has two forms: the short form c'est moi (say mwah) is more common than the phrase from which it stems: c'est moi qui vous remercie (say mwah kee voo ruh mair see), literally meaning 'it's ME who thanks YOU'. This is used by the most genuine of shopkeepers and the most gracious of maître d's. 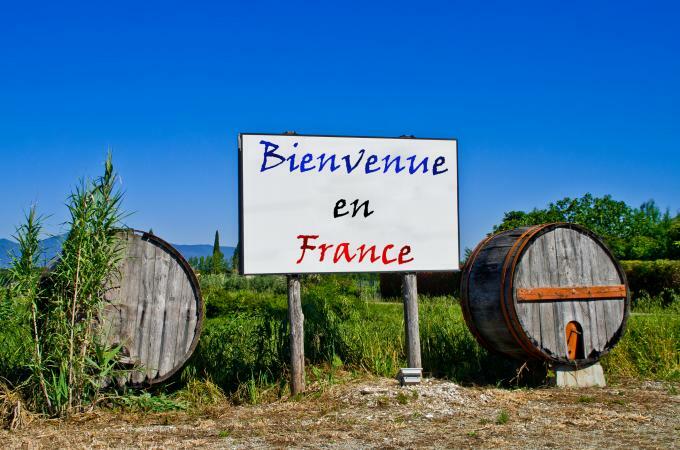 If you would like to welcome somebody to your home, city or country, you can use the word bienvenue (bee en vuh noo). For example, if a visitor arrives at your front door, you might simply say 'bienvenue' as you usher him into the house, after having shaken his hand or kissed his cheeks (depending on whether the person is a friend or an acquaintance, and depending on your gender). Pronounced bee ehn vuh noo ohn Frahnce, you'll hear this phrase often as people welcome you to their country. You'll also hear phrases like bienvenue à Paris or bienvenue au Canada. Some grammatical considerations come into play in these expressions: the preposition à is used before a city name, the preposition au is used before a country that is masculine, and the preposition en is used before a country which is feminine. Bienvenue à Québec means 'welcome to the city of Québec'. Bienvenue au Québec means 'welcome to the province of Québec'. To welcome someone to a country whose name is plural, such as the United States, the preposition is aux: bienvenue aux États-Unis. Be sure to sort out the two different senses of 'you're welcome'; that's the most important distinction. Once you've chosen the correct meaning of the phrase, choosing between all the different ways to say 'you're welcome (for…)' and the ways of saying 'you're welcome (to…)' are nuances that will develop over time as your French improves.